Stone is the complementary other half to plants in the landscape. While the vegetation may change throughout the season and over the years, rocks remain constant, providing a permanent visual presence to frame the ever-changing plantscape, as well as fulfilling many practical purposes. One of the most basic and inexpensive landscape rock is often referred to as riprap. It can range from the size of a mini-football to a small dog, but always comes with many flat, angular sides - perfect for building a simple rock wall or any other utilitarian project in a variety of garden settings. Fine stone walls require rocks that have been processed to create right angles and flat sides. Natural wall block is costly, but much more stackable than randomly shaped rocks, reducing labor and leading to a more uniform appearance in the end. Large, handsomely-shaped stones make great accents in the landscape, giving a sense of grandness and strength to the garden. Placed upright or horizontally, they can even support plant life in their nooks and crannies. To keep them from looking strangely out of place, really big rocks should always be buried part way wherever they sit. Some stones come with moss and lichen already included, commonly referred to as field stones because they are taken from the surface of the earth, rather than quarried. These are some of the most attractive stones (and surprisingly inexpensive), which are a natural fit for water features or scattered through the landscape to mimic a boulder-strewn field. Flags are thin, flat rocks that can be used for paving paths and patios. They come in a variety of colors and are a natural alternative to concrete pavers. You can also use flagstones to create a cap on a rock wall that functions as a convenient place to sit on the garden. Smooth, rounded stones ranging from the size of a tennis ball to a basketball are fitting for water features, though they are quite often used to line the earth in dry stream bed plantings - broad ditches that carry water only when it rains, which are planted with reeds, sedges and other water-loving plants. Smaller river stones are often used on their own as a sleek-looking groundcover, great for a Zen garden effect. They can also be used to fill in the spaces between larger river rocks, helping to create a dry stream bed with a more natural appearance. White marble chips are another type of decorative groundcover, conducive to landscaping without plants, on a walkway or to use around the base of plants, especially succulents and cacti. These chips have a white powder coating than gives them their color. This common decorative gravel is comprised of multi-colored earth tone pebbles that are generally about one-half inch in size. 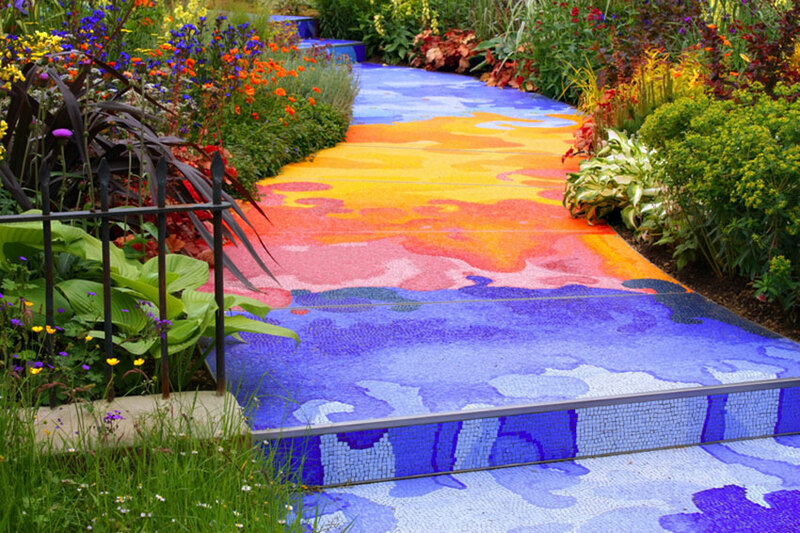 It's frequently used as a walking surface for paths and patios, as well as to fill in the spaces between stepping stones and flagstones - it can even be used on driveways. Common gravel is purely for utilitarian purposes, primarily used as a surface for walking or vehicles. It is also plays a purpose in drainage systems and to create a firm base under foundations for patios, retaining walls and other landscape structures. Essentially crushed gravel, granite fines are also utilitarian in nature and are used wherever a fine-textured structural quality material is needed. Its most common application in landscaping is as a base material for paths and patios - the fines can easily be raked into a smooth, flat bed that makes it easy to lay pavers or flagstone. Natural stone gives a timeless, luxurious feel to the landscape and comes in a full palette of colors and textures to design with. Instead of using concrete look-alikes in your next landscaping project, head to the local landscape supplier and ask to see the stone products they offer.